I usually link to a photograph of the person whose hand is read, and those interested in seeing more hand photos of a particular celebrity can easily find the photographs by searching the web. This is because no copyrighted photos are reproduced on this website. Although it is obvious, I think it is necessary to spell out the fact that the character analysis is based on Hand Reading and not from any personal knowledge of the people. Sure, it is natural to get influenced by what is said or is believed about the celebrity but I only write what I actually see on the hand. There are those who may not agree with my analysis. This is because just like two doctors who could give out a different diagnosis, two hand readers could do the same. 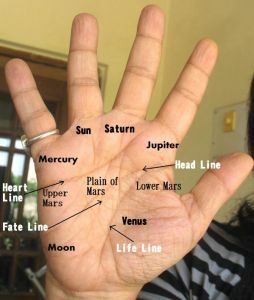 The challenge and skill in palmistry is to take the various signs and marks and interpret them in the correct way. Nowhere do I suggest that I am the final authority on the character of the people analysed, but naturally I do believe that what I write is correct. If I didn't, I wouldn't write it. Readers are welcome to send me the names of the famous people whose hands they want read. If I find a sufficient number of good photos of that person's hand then I will do the reading on this blog. I do not charge for the hand readings of famous people. I also do private hand readings of individuals, on payment. The details can be found in the post: What to expect from a private hand reading . The price of private readings is not given on this blog as it depends on the quality of photographs I receive and also the type of reading required. A complete reading will be around 15-20 pages long. 1) Character Analysis and a few future trends (from the shape of the hands, fingers and lines). 3) Fingerprint reading which reveals your innermost desires and fears. It will tell you about the activity that will make you happy and fulfilled. What is the right life for you and what the obstacles are that are preventing you from being true to yourself. This also reveals the issues you struggle with, and the issues which are most important to you, the make or break issues. 4) A detailed explanation of the lines. Hello, I cant figure out what is the price for a reading, so would you be so kind to inform about the same? Shashikant, My fees depend on what questions are asked and also the quality of the photos. If I don't get good quality photos I can do only a character analysis and not anything more. Once I receive the photos I will let you know the charges which are not very high. I have always been intrigued by palmistry and its related aspects and have always wanted to have a genuine assessment of my palms. I beleive that the lines on the palm have something to say . If not, they either wouldn't have been there or would have been the same on each of our palms,either of which is not the case. Hence, was wondering if I could have a detailed assessment of my palm. Could you kindly reply to this post via email. My email is leji.john@gmail.com. I shall discuss your payment menthods and give you something about my whereabouts in the mail Didn't find your mail here, hence the post. Thanks for writing in John. Will send you a reply by email. Can you do Tarun Tejpal's hand pls Nita ? I have already tried to get his hand photos as I like to read the hands of those who are currently in the news. Unfortunately I have not been successful in getting decent palm photos of his hands.